I've only been blogging for (whoa!) almost a year, and Wednesday I was given my first blog award from Colette of Colette's Bakery! 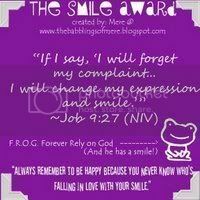 She awarded me The Smile Award. 1. Emiline from Sugar Plum. Emiline's enthusiasm for baking is quite evident. From the creation of her own recipes to the amazing pictures she takes, it's always a joy to read her blog because we are in for a treat each time. Also, the pictures of her little nephew are adorable! 2. Adam from Baking with Dynamite. Not only are his baking creations wonderful, but he most certainly contributes to the blogging world with his "Fun Fitness Fridays". Anyone who wants to share with others what they know for the better is someone to be admired, and that's why I want to give this award to him. 3. Laurie from Quirky Cupcake. She started two wonderful foodie blogging events, Cupcake Hero and Tuesdays with Dorie. The dedication it takes to run events is something that is appreciated by everyone involved and those who just read the posts. 4. Glamah16 from Coco Cooks. I love how she cooks such unique foods, as well as taking us into her world at times. I often think how the foodie community is like another family, and Glamah's blog definitely is one that gives that feeling. 5. Tina from Carrots 'N' Cake. A healthy balance with food is something we all strive for, and Tina's blog definitely has that. Sometimes we need help to see what a healthy balance looks like, and the pictures of her meals can definitely help you do that. The next surprise was when I went to Adam from Baking with Dynamite. He was awarded The Brillante Weblog Award (congrats! ), and I was one of the bloggers he passed it along to, and which I will pass along to five more bloggers! 1. Colette from Colette's Bakery. Colette is a young blogger who creates extraordinary things! I'm always impressed by what she makes. 2. Ben from What's Cooking. Ben's recipes are creative, delicious, and the pictures are always great. His website is fun to browse through, and you will always find something interesting to read and learn about. 3. Mary from The Sour Dough. Mary bakes such amazing bread, and her Weekend Cat Blogging posts are hilarious to read! 4. Lisa from Pittsburgh Needs Eated.. The treats and desserts Lisa makes rival anything found at a cafe or 5-star restaurant. Her pictures excellently showcase what she makes and leaves you wishing you could have some of it! 5. Aaron from A Journey in Chocolate, Culture & Food. Aaron knows his chocolate, it's really quite impressive! I don't just mean eating it, but creating his own chocolates. Many of us have made truffles before, just think of that x10 and you've got Aaron. It is possible a lack of protein caused you to get injured. What was your injury, if you don't mind me asking. You can shoot me an email if it's personal. OMG - you got an award...congrats! I can't wait until I get one. Oh, shucks. Thanks a lot! I'm going to have to post more pictures of my nephew, I guess. I don't know how my sister will feel about that. Are you sure I deserve this award? I don't feel like I do. I'm negative at times. Thank you for thinking of me, and for your lovely compliments. It's so nice to hear that people enjoy the blog.